(10:40 a.m. EDT) -- American Cruise Lines is continuing to build up its U.S.-based fleet of coastal and river cruises, with another vessel launching this summer and more ships coming in 2020 and 2021. In fall 2018, American Cruise Lines debuted the first of five "modern" riverboats for U.S. waterways. The modern-style boats are built to give passengers a different style of river cruising in the U.S., with features such as a soaring atrium, large suites and contemporary design. These ships also lack a paddlewheel, which traditionally has been the look you find on American river cruises (American Cruise Lines does have several boats with paddlewheels added to them). American Song began cruising in October 2018 and is now sailing the Columbia and Snake rivers in the Pacific Northwest. The second modern riverboat, American Harmony, debuts in August 2019, with itineraries on the Mississippi River. The third riverboat, American Jazz, arrives in 2020 and will also cruise the Mississippi River. It's currently being built at American Cruise Lines' affiliated shipyard, Chesapeake Shipbuilding, in Salisbury, Maryland. The fourth and fifth ships will arrive in 2020 and 2021, schedule depending (since American Cruise Lines owns its own shipyard, its ships often debut ahead of schedule). In addition, the line is adding one other new boat in 2020; by 2021, the fleet will have grown from 11 vessels to 15. While the modern riverboats are similar in design, there are a few differences. 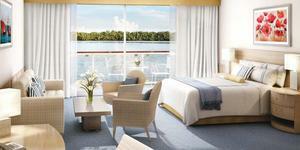 American Song has five decks and 900 square-foot Grand Suites with wrap-around balconies. American Harmony has six decks with one deck exclusively having 10 Veranda Suites, all 405 square feet with a private balcony. American Jazz will be slightly larger than either of the first two. All the ships in the series have a capacity for less than 200 passengers.